A collection of engaging, insightful and provocative essays, Paul Tiyambe Zeleza, shares his critical perspectives on Africa and the African Diaspora through the lens of an African intellectual. Zeleza, who was born in Harare and raised in Malawi, is a renowned scholar, teaching across the continents of Africa and North America. He is also an acclaimed author, critic and commentator on Africa, its history, economy and politics, and culture. He is the founder of the Zeleza Post, a highly respected blog focused on the Pan-African world. In this selection of discourses, drawn from his blog, Zeleza holds nothing back as he dissects Africa’s complex political, social and economic standing to the rest of the world. With an interesting twist, Zeleza wraps his essays, all written before and after 2008, around the potent symbolism of Barack Obama’s presidential election victory of the same year. From the opening essay, President Obama: America Finally Grows Up to his final offering, Waiting for The Obama Dividend: The Future of Africa-Us Relations, Zeleza writes with an adept intelligence and fluid understanding of his chosen topics, which makes politics on the global stage and its multi-faceted nature interesting to those who are least interested. In President Obama: America Finally Grows Up, Zeleza writes about the electrifying and historic achievement of the Obama election. He marries this pivotal moment to “the cherished migrant narrative of American history where non-African Americans tend to see themselves as descendants of brave or heroic migrants,” who come with little but achieve much, creating their own narrative with a slice of the American dream. At the same time, he exposes and explores the complexities of race and racism through the different waves of the African Diaspora communities in the west and how that has evolved over the years. 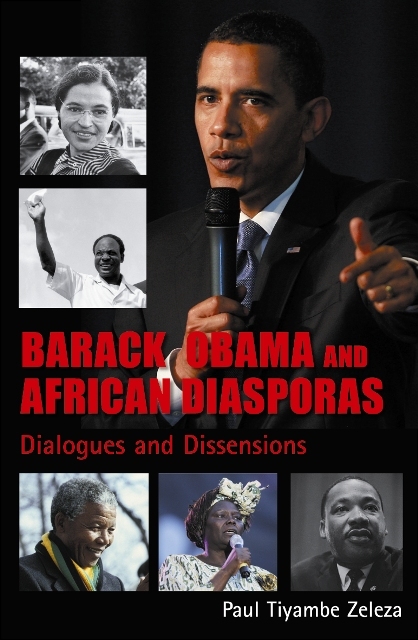 A point of view best explained as he talks about the fact that when Barack Obama first declared his candidacy for president, many questioned his ‘Blackness,’ in the title essay, Barack Obama and African Diasporas: Dialogues and Dissensions. Most importantly, Zeleza focuses on Africa’s political development when he analyses what the election of the first woman president in Liberia means for other African women in politics in Madam President: The Changing Gender Dynamics of African Politics. He also examines political ills in Kenya and Zimbabwe. Economically he explores the trade relationship between Africa and China, which has stirred both a disingenuous caution from the west but passion about a new alliance in Africa, in Dancing With The Dragon: Africa’s Courtship With china. While Zeleza sometimes comes across as speaking for the oppressed, he does captivate the essence of the fractured relationship between Africa and the African Diaspora, and the West. For anyone who wants to learn more about Africa, its past, present and gain insight into its future, this book will surely answer a lot of your questions and make you think differently about the African continent. This entry was posted on Tuesday, August 3rd, 2010 at 4:42 pm	and is filed under Africa, Book Reviews, Journalism. You can follow any responses to this entry through the RSS 2.0 feed. You can leave a response, or trackback from your own site. I am grateful I found your website on ask. Thanks for the sensible critique. Me and my wife have been just preparing to do some research in regards to this. I’m very happy to see such terrific details currently being shared freely out there.